I am loving the blingy cards!! All the sparkles and glitter! Sparkle n Sprinkle has over 80 glitters, so there are so many to try and play with! The top card I did some more of the enhancing of the DSP. 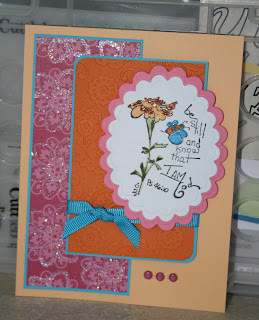 I used the Bali Breeze DSP from Stampin' Up!, then added some Bubble Gum glitter to the flowers. I stamped with Black Stazon and colored with my SU Markers, and colored the bee and flower with Autumn Medley and Rhapsody glitters. It just adds that little bit of pazzazz to to card. The stamp is one of the retired Christian stamps, again, if you like the image let Margaret know and she will make it special for you. The color combo is Apricot Appeal, Pumpkin Pie, Tempting Turquoise, Rose Romance and WW, I got that combo from the DSP. Not normally one I would pick myself, but I really like it. The Pumpkin Pie layer was run through the Paisley Cuttlebug folder. The image was cut out with the Nestibilities. Another glitter lace background. 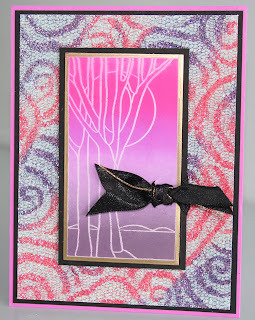 I love the different lace patterns and all the possibilities with all the colors of glitter. On this one I used Raspberry Soda, Eggplant and Sparkling Snow. If you want to see a tutorial, it's here. For the image I used the Versamark Resist technique, I stamped on Glossy White with Versa Mark and brayered over it with the Parfait Spectrum pad and then wiped with a paper towel. I used the Gold Krylon pen to edge the cardstock and layered it on black. The ribbon is just a scrap I had laying around with a piece of gold cord with it. The cardbase is some paper I had from Marco's stack, not sure of the color. Thanks for stopping by and leaving the wonderful comments....I love to hear what you think!